"That's how dictators get started… They get started by suppressing free press," McCain said of dictators. "In other words, a consolidation of power when you look at history, the first thing that dictators do is shut down the press. And I'm not saying that President Trump is trying to be a dictator. I'm just saying we need to learn the lessons of history." History tells us that while dictators may end up suppressing the media, how they “get started” is not by suppressing the media, but by politicizing it. 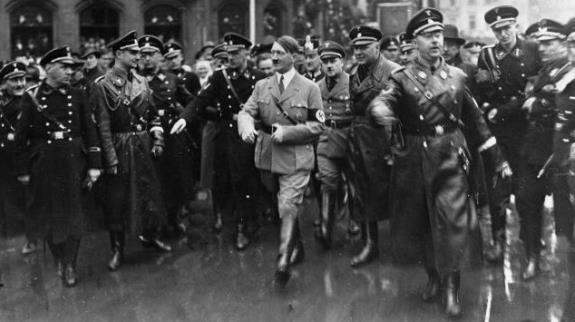 When Hitler came to power in 1933, 81% of all German newspapers were locally owned. In 1933, over 4,700 daily and weekly newspapers were published annually in Germany, more than in any other industrialized nation. Der Stürmer (The Stormtrooper) was the most notorious anti-Semitic newspaper in Germany. Founded by Julius Streicher in 1923, it published its hateful message for more than 10 years before Hitler came to power. Völkischer Beobachter (People’s Observer) was purchased by Adolph Hitler in 1923 to serve as the propaganda organ of his Nazi Party, it also published for 10 years before the Nazis came to power in 1933. While these publications are mostly remembered for their virulent anti-Semitism, one of their major goals was to undermine the then-democratic government of Germany and to build the case for the election of the Nazis. These highly politicized media outlets were as unrelenting in claiming the duly elected government was illegitimate and in criticizing the policies of the duly elected leadership of the government, as they were in blaming Germany’s economic problems on an imaginary Jewish financial conspiracy. Which is exactly what the progressive Left did during the Obama years, and what it is doing now through its war on President Trump and his supporters in conservative opinion and news outlets, especially in the new and alternative media. But then again, the establishment media here in the United States has a long history of politicizing the news in favor of tyranny, and for the purposes of making money. As The (UK) Guardian reported, the Associated Press news agency entered a formal cooperation with the Hitler regime in the 1930s, supplying American newspapers with material directly produced and selected by the Nazi propaganda ministry, archive material unearthed by a German historian revealed. In an article published in the German academic journal Studies in Contemporary History, historian Harriet Scharnberg shows that AP was only able to retain its access by entering into a mutually beneficial two-way cooperation with the Nazi regime. Reminder: This is the same kind of “access for propaganda” deal CNN had with Saddam Hussein and other dictators. This law required AP to hire reporters who also worked for the Nazi party’s propaganda division. One of the four photographers employed by the Associated Press in the 1930s, Franz Roth, was a member of the SS paramilitary unit’s propaganda division, whose photographs were personally chosen by Hitler. In an attempt to hide its disgusting duplicity, AP has removed Roth’s pictures from its website after Scharnberg published her findings, though thumbnails remained viewable for a while due to “software issues”. AP also allowed the Nazi regime to use its photo archives for its virulently anti-Semitic propaganda literature. According to Harriet Scharnberg’s research, publications illustrated with AP photographs include the bestselling SS brochure “Der Untermensch” (“The Sub-Human”) and the booklet “The Jews in the USA”, which aimed to demonstrate the decadence of Jewish Americans with a picture of New York mayor Fiorello LaGuardia eating from a buffet with his hands. Today, at AP and other establishment media outlets there’s a Schriftleitergesetz called political correctness that molds the news every bit as effectively as the old Nazi editor’s law – it deletes “illegal alien” in favor of “undocumented migrant” and substitutes 58 “gender identities” for the scientific sexual divisions of male and female and distorts the news in countless other ways. The parallels between the situation in Germany then and America now are striking. In America today, the threat to constitutional liberty comes not from President Trump, but from a small politicized media elite that feeds an unending stream of propaganda to its audience. Opponents are vilified through campaigns of personal destruction, anti-Semitism is rampant, the duly elected government is claimed to be illegitimate and alternative sources of information and opinion are marginalized by the establishment propaganda organs. Contrary to what Senator McCain said about dictatorship "starting" by suppressing a free press, it is not hard to see the parallels between today’s free, but highly politicized establishment elite media and the media in Germany that helped Adolf Hitler and the Nazis take power. CHQ Editor George Rasley's family has been in the media and newspaper business for over 160 years. He received his first byline in 1976 for an article published in The Goshen (Indiana) News. Submitted by Arizona Don on Wed, 02/22/2017 - 13:50. If John McCain’s statement about “how dictatorships begin” is an example of his understanding of how hitler got into power, or his intelligence, perhaps he is not smart enough to be a Senator. This article is spot on and McCain is about two bubbles off plum. Of course most of us knew that anyway! Submitted by Charles Martel on Wed, 02/22/2017 - 23:19. McCain is not smart enough to be a good or conscientious senator, but he obviously knows how to feather his nest in D.C.! (And I had to vote for him last time around to keep Communist Ann Kirkpatrick from taking his seat!) Kudos on such an informative, fact-based article! Question for McCain: Doesn't President Trump have First Amendment rights, too? Submitted by email_registrat... on Wed, 02/22/2017 - 12:43. There is a huge difference between a lying gangbanging group of progressive agenda pushing manipulators and real Journalists. The Manipulators want you to believe their version. The Journalists report the facts and let you decide what you will believe. Submitted by email_registrat... on Wed, 02/22/2017 - 12:25. The left likes to demonize conservatives with invectives of, bigot, racist, homophobe, xenophobe, Islamaphobe and just constant vituperation of our president. They will soon learn that electing Hillary would have been a disaster.